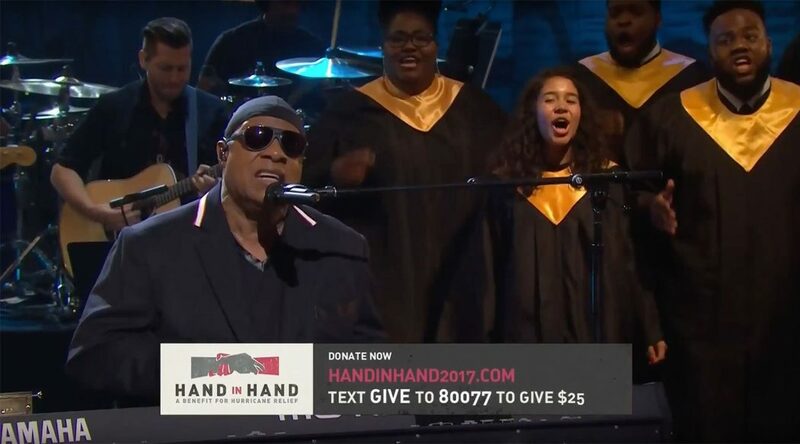 Stevie Wonder And Beyonce Keep It Real During Telethon Event For Hurricane Relief, Call Out Racists And Climate Change Deniers (VIDEO) - T.V.S.T. If you were home last night, you probably saw the Hand in Hand: A Benefit for Hurricane Relief telethon on every major network on TV. Almost every celebrity you can think of was at this event, including, two legends: Stevie Wonder and Beyonce. Wonder kicked off the event with a special performance of Lean On Me, but before he started singing, he talked to the audience at home about love, racism and climate change. And he wasn’t the only one speaking out. Beyonce, who was born and raised in Houston, gave a heartfelt message to the people of her hometown. That was just the first half of her message. The 36-year-old singer continued her powerful speech by talking about all the disasters happening around the world right now. In total, the event raised over $44 million for victims of Hurricane Harvey and Irma. It’s safe to say it was a huge success. Tyrese Has A Restraining Order and Temporarily Loses Custody of Daughter Over Shocking Child Abuse Allegations. Drags Ex-Wife on Social Media in Response!